This review will NOT be in 3D! So take off those stupid glasses! Also, this is not in any way an April Fools joke. I’m no good at those anyways, so this is just a normal movie review! In fact, I didn’t see the movie in 3D either. The Regal theater at Pointe Orlando only offered the 3D version in their IMAX theater, and the price and timing wasn’t right, so I had to “deal” with the 2D version. 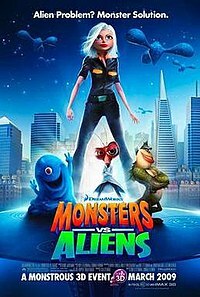 “Monsters vs. Aliens” is a just released DreamWorks Animation 3D animated movie. These are the same people who brought you Shrek, in fact, if you pay CLOSE attention during the movie there is a small shout out to Shrek on the uniform of one of the characters. If you check my blog recently you know that yesterday was Free Movie Monday from RedBox and I decided to rent “Bee Movie.” Yes I know, a cartoon for a lonely 27 year old male isn’t the most obvious choice, but I don’t care! Bee Movie is a DreamWorks picture, so it couldn’t be that bad. The animation, like ALL DreamWorks pictures is amazing and the movie has a TON of stars. It, of course, stars Jerry Seinfeld as the lead character but also includes Renée Zellweger, Matthew Broderick, Megan Mullally, John Goodman, Chris Rock, Kathy Bates, and Patrick Warburton (from my favorite show of all time “The Tick“).